BrewLock is a patented new tap system technology from Heineken, which forces beer through draught lines by a customized air compressor instead of the traditional carbon dioxide or nitrogen. Instead, the Brewlock was developed to consistently deliver the best possible draught beer without changing anything about the beer itself. This was accomplished, according to Heineken, by having no gas actually comes in contact with the beer. This gives BrewLock what Heineken calls “as close to brewery quality as is currently possible”. Fortunately, Bergen County beer fans don’t have to wait to try some Heineken via a Brewlock. 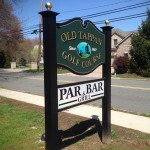 The 9 Iron Grille, which is the restaurant and bar at the Paramus Golf Club (open to the public), recently had it installed and is pouring the fresh Heineken today. The restaurant features a menu of casual American dining for breakfast, lunch and dinner seven days a week.